A cairn is a man-made pile (or stack) of stones. The word cairn comes from the Scottish Gaelic: càrn (plural càirn). Cairns are found all over the world in uplands, on moorland, on mountaintops, near waterways and on sea cliffs, and also in barren desert and tundra areas. They vary in size from small stone markers to entire artificial hills, and in complexity from loose, conical rock piles to delicately balanced sculptures and elaborate feats of megalithic engineering and may date back to ancient times. Cairns may be painted or otherwise decorated, whether for increased visibility or for religious reasons. In modern times, cairns are often erected as landmarks or as navigational aids on hiking trails. Many cairns are constructed by those who wish to "leave their mark" showing their achievement in reaching that point, for example the summit of a mountain. However, the intent behind their construction is traditionally not self-service but to serve others as a navigational aid or as a memorial or landmark denoting the highest point of a hiking trail. The word cairn derives from Scots cairn (with the same meaning), in turn from Scottish Gaelic càrn (plural càirn) meaning “heap of stones.” It is essentially the same as the corresponding words in other native Celtic languages of Britain and Ireland, including Welsh carn (and carnedd), Irish carn, and Cornish karn or carn. Cornwall (Kernow) itself may actually be named after the cairns that dot its landscape, such as Cornwall's highest point, Brown Willy Summit Cairn, a 5 m (16 ft) high and 24 m (79 ft) diameter mound atop Brown Willy hill in Bodmin Moor, an area with many ancient cairns. Cairn originally could more broadly refer to various types of hills and natural stone piles, but today is used exclusively of artificial ones. Cairn of the Neolithic-era passage grave on Gavrinis island, Brittany. The building of cairns for various purposes goes back into prehistory in Eurasia, ranging in size from small rock sculptures to substantial man-made hills of stone (some built on top of larger, natural hills). The latter are often relatively massive Bronze Age or earlier structures which, like kistvaens and dolmens, frequently contain burials. They are comparable to tumuli (kurgans), but of stone construction instead of earthworks. Burial cairns and other megaliths are the subject of a variety of legends and folklore throughout Britain and Ireland. In Scotland, it is traditional to carry a stone up from the bottom of a hill to place on a cairn at its top. In such a fashion, cairns would grow ever larger. An old Scottish Gaelic blessing is Cuiridh mi clach air do chàrn, "I'll put a stone on your cairn." In Highland folklore it is believed that the Highland Clans, before they fought in a battle, each man would place a stone in a pile. Those who survived the battle returned and removed a stone from the pile. The stones that remained were built into a cairn to honor the dead. Cairns in the region were also put to vital practical use. For example, Dún Aonghasa, an all-stone Iron Age Irish hill fort on Inishmore in the Aran Islands, is still surrounded by small cairns and strategically placed jutting rocks, used collectively as an alternative to defensive earthworks because of the karst landscape's lack of soil. In Scandinavia, cairns have been used for centuries as trail and sea marks, among other purposes. In Iceland, cairns were often used as markers along the numerous single-file roads or paths that crisscrossed the island; many of these ancient cairns are still standing, although the paths have disappeared. In the mythology of ancient Greece, cairns were associated with Hermes, the god of overland travel. According to one legend, Hermes was put on trial by Hera for slaying her favorite servant, the monster Argus. All of the other gods acted as a jury, and as a way of declaring their verdict they were given pebbles, and told to throw them at whichever person they deemed to be in the right, Hermes or Hera. Hermes argued so skillfully that he ended up buried under a heap of pebbles, and this was the first cairn. In Croatia, in areas of ancient Dalmatia, such as Herzegovina and the Krajina, they are known as gromila. In Portugal a cairn is called moledro. In a legend the stones, moledros, are enchanted soldiers, and if one stone is taken from the pile and put under a pillow in the morning a soldier will appear for a brief moment, then will change back to a stone and magically return to the pile. The cairns that mark the place where someone died or cover the graves alongside the roads where in the past people were buried are called Fiéis de Deus (spirits of the night), with the same name given to the dead whose identity was unknown. Ancient cairns in Qa’ableh, Somalia. Since Neolithic times, the climate of North Africa has become drier. A reminder of the desertification of the area is provided by megalithic remains, which occur in a great variety of forms and in vast numbers in presently arid and uninhabitable wastelands. These include cairns (kerkour) and dolmens, as well as stone circles like Stonehenge, underground cells excavated in rock, barrows topped with huge slabs, and step pyramid-like mounds. 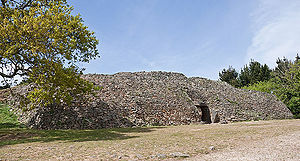 Northern Somalia is home to numerous historical settlements and archaeological sites containing ancient ruins and buildings, many of obscure origins. Cairns (taalo) are a common feature at Elaayo, Haylaan, Qa’ableh, and Qombo'ul, among other places. In South Korea cairns are quite prevalent, often found along roadsides and trails, up on mountain peaks, and adjacent to Buddhist temples. Hikers frequently add stones to existing cairns trying to get just one more on top of the pile, to bring good luck. This tradition has its roots in the worship of San-shin, or Mountain Spirit, still revered in Korean culture. There remains a Jewish tradition of placing small stones on a person's grave as a token of respect, though this is generally to relate the longevity of stone to the eternal nature of the soul and is not usually done in a cairn fashion. Stupas (literally meaning "heap" - a mound-like or hemispherical structure containing Buddhist relics and used by Buddhists as a place of meditation) in India and Tibet probably started out in a similar fashion, although they now generally contain the ashes of a Buddhist saint or lama. A cairn marking the peak of Bald Mountain, the Adirondack Mountains, USA. 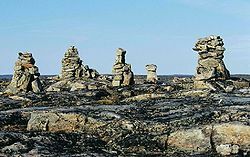 Natives of arctic North America (in northern Canada, Alaska and indigenous Greenland) have traditionally built carefully constructed cairns and stone sculptures, called by names such as inuksuit and inunnguat, as landmarks and directional markers. They are iconic of the region and are increasingly used as a symbol of Canadian national identity. Throughout what today are the continental United States and Canada, cairns still mark indigenous peoples' game-driving "lanes" leading to buffalo jumps, some of which may date to 12,000 years ago. Cairns have been used since pre-Columbian times throughout Latin America to mark trails. Even today in the Andes of South America, the Quechuan peoples use cairns as religious shrines to the indigenous Inca goddess Pachamama, often as part of a synchretic form of Roman Catholicism. Although the practice is not common in English, in some cultures cairns are sometimes referred to by their anthropomorphic qualities. In German and Dutch, a cairn is known as steinmann and steenman respectively, meaning literally "stone man." 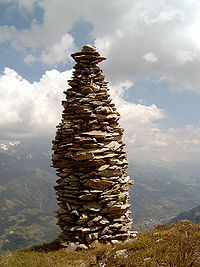 In Italy, especially the Italian Alps, a cairn is an ometto, or a "small man." A form of the Inuit inuksuk, called an inunguak ("imitation of a person"), also represents a human figure. Today, cairns are built for many purposes. The most common use in North America and Northern Europe is to mark mountain bike and hiking trails and other cross-country trail blazing, especially in mountain regions at or above the tree line. Placed at regular intervals, a series of cairns can be used to indicate a path across stony or barren terrain, even across glaciers. Such cairns are often placed at junctions or in places where the trail direction is not obvious, and may also be used to indicate an obscured danger, such as a sudden drop, or a noteworthy point such as the summit of a mountain. Most trail cairns are small, a foot or less in height, but may be built taller so as to protrude through a layer of snow. For example, the extensive trail network maintained by the DNT, the Norwegian Trekking Association, extensively uses cairns in conjunction with T-painted rock faces to mark trails. Similarly, cairns or ahu can be seen in the lava fields of Volcanoes National Park in Hawaiʻi to mark several hikes. The Presidential Range in the White Mountains of New Hampshire are frequently obscured by clouds and fog which led to the creation of cairns to mark that section of the Appalachian Trail to make it safe for hikers during the nineteenth century. Today the Appalachian Mountain Club maintains these cairns, repairing them and dismantling cairns built by visitors that may cause confusion. Cairns on hiking trails serve not only as navigational aids to keep hikers safe, they also reduce environmental impact by keeping people on the trail. Hikers passing by cairns often add a stone, as a small bit of maintenance to counteract the erosive effects of severe weather. Unfortunately, hikers may also construct new cairns leading to a proliferation of piles of stones moved from their original locations resulting in damage to the vegetation as well as loss of clarity in marking the trails. One of many cairns marking British mass graves at the site of the Battle of Isandlwana, South Africa. Modern cairns may also be erected for historical or memorial commemoration or simply for decorative or artistic reasons. One example is a series of many cairns marking British soldiers' mass graves at the site of the Battle of Isandlwana, South Africa. Another is the Matthew Flinders Cairn on the side of Arthur's Seat, a small mountain on the shores of Port Phillip Bay, Australia. Some cairns are merely collections of stones that farmers removed from a field, or they may mark places where livestock were lost. Examples can be seen in the Catskill Mountains, North America where there is a strong Scottish heritage. In locales exhibiting fantastic rock formations, such as the Grand Canyon, tourists often construct simple cairns in reverence of the larger counterparts. By contrast, cairns may have a strong aesthetic purpose, for example in the art of Andy Goldsworthy, the founder of modern rock balancing. Cross sections of Maeshowe, a Neolithic chambered cairn and passage grave situated on Mainland, Orkney, Scotland. A chambered cairn is a burial monument, usually constructed during the Neolithic, consisting of a sizable (usually stone) chamber around and over which a cairn of stones was constructed. Some chambered cairns are also passage-graves. They are found throughout Britain and Ireland, with the largest number in Scotland. Typically, the chamber is larger than a cist (a small stone-built coffin-like box or ossuary used to hold the bodies of the dead), and will contain a larger number of interments, which are either excarnated bones or inhumations (cremations). Most were situated near a settlement, and served as that community's "graveyard." All have narrow rectangular chambers whose positions are marked by wooden posts. The last two are especially interesting, because stone chambers were built into the mound at a later date. At Balnuaran of Clava itself there is a group of three Bronze Age cairns which lie close together in a line running north east to south west. The tombs at either end are of the passage grave sub-type. 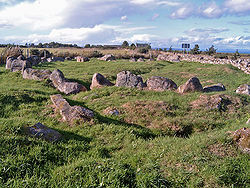 The central cairn is of the ring cairn sub-type, and uniquely has stone paths or causeways forming "rays" radiating out from the platform round the kerbs to three of the standing stones. The cairns incorporate cup and ring mark stones, carved before they were built into the structures. The kerb stones are graded in size and selected for color, so that the stones are larger and redder to the south west, and smaller and whiter to the north east. All these elements seem to have been constructed as one operation and indicate a complex design rather than ad hoc additions. 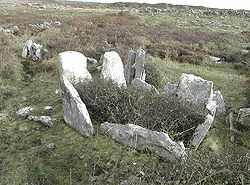 The court cairn or court tomb is a megalithic type of chamber tomb and gallery grave. It is a variant of the chambered cairn, found in western and northern Ireland, and in southwest Scotland (where it maybe also be called a horned cairn or Clyde-Carlingford tomb), around 4000–3500 B.C.E., but many remained in use until as late as the Bronze Age transition, c. 2200 B.C.E. They usually had two functions: the chamber to serve as a tomb, and the courtyard to accommodate a ritual. Objects were often buried with the deceased, as the first megalithic farmers of this time believed in life after death. In Scotland, court cairns are most common in what today are Argyll and Dumfries and Galloway (where they form the Clyde-Carlingford group), though a small outlying group have been found near Perth. A ring cairn (also correctly termed a ring bank enclosure, but sometimes wrongly described as a ring barrow) is a circular or slightly oval, ring-shaped, low (maximum 0.5 meters (1.6 ft) high) embankment, several meters wide and from 8 meters (26 ft) to 20 meters (66 ft) in diameter. 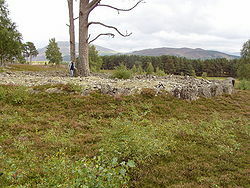 These cairns look like flat variants of the significantly higher Clava cairns, which are often called ring cairns by laymen. Although details vary from one site to another, nearly all comprise a ring of small upright stones set on the inner edge of a roughly circular bank. 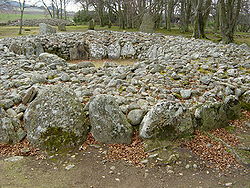 The ring cairn is made of stone and earth and was originally empty in the center. 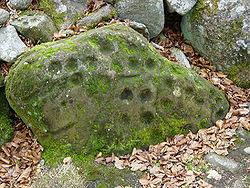 In several cases the middle of the ring was later used (at Hound Tor, for example there is a stone cist in the center). The low profile of these cairns make them difficult to observe without conducting excavations. Sites date to the Bronze Age and occur in Cornwall, Derbyshire (Barbrook IV and V and Green Low) in England, in Wales, and in Ireland. Ring cairns may have had a function that lay somewhere between that of the much older henges and the contemporary stone circles. The fact that in southeast Wales there are so few stone circles, could be related to the fact that ring cairns were built there instead. 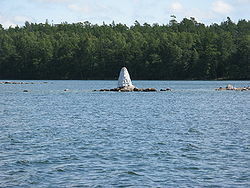 Sea mark in Finnish coastal waters. Sea cairns or coastal cairns are built on a submerged rock/object, especially in calmer waters, and serve as sea marks. They are common in the northern latitudes, placed along shores and on islands and islets, especially in the island-strewn waters of Scandinavia and eastern Canada. Usually painted white for improved offshore visibility, they serve as navigation aids. In Scandinavia they are called kummel in Swedish and kummeli in Finnish, and are indicated in navigation charts and maintained as part of the nautical marking system. They are also used on land as sea cliff warnings in rugged and hilly terrain in the foggy Faroe Islands. In the Canadian Maritimes, cairns have been used as beacons or small lighthouses to guide boats, as depicted in the novel The Shipping News. ↑ Peter Drummond, Scottish Hill Names (Scottish Mountaineering Trust, 2007, ISBN 978-0907521952). ↑ Gabriela Morais, A Genética e a Teoria da Continuidade Paleolítica aplicada à Lenda da Fundação de Portugal e Escócia (Apenas Livros, 2008). (Portuguese) Retrieved May 23, 2014. ↑ Michael Hodd (ed. ), East African Handbook (Passport Books, 1995, ISBN 978-0844288888). ↑ David Mason, Spirit of the Mountains - Korea's San-Shin and Traditions of Mountain Worship (Hollym International Corp., 1999, ISBN 978-1565911079). ↑ Backcountry Hikes - Hawai'i Volcanoes National Park Nps.gov. Retrieved May 23, 2014. ↑ Michael Gaige, Stone on Stone: A natural and social history of cairns AMC Outdoors, March/April 2013. Retrieved May 23, 2014. ↑ Three-language key to reading Finnish navigation charts Finnish Transport Agency and Finnish Transport Safety Agency (TraFi). Retrieved May 23, 2014. Gaige, Michael. Stone on Stone: A natural and social history of cairns AMC Outdoors, March/April 2013. Retrieved May 23, 2014. Lynch, Frances. Ring cairns in Britain and Ireland: their design and purpose Ulster Journal of Archaeology 42 (1979):1-19. Retrieved May 23, 2014. Notes on Building a Cairn (pdf), by Dave Goulder for the Dry Stone Walling Association of Great Britain. This page was last modified on 23 December 2016, at 16:51.